Dooley was our first flatcoat who had the wonderful quirky flatcoat sense of humour. His sire was Branchalwood Kyle (imp UK) and his dam was Ch Lavenderpark Prologue. He endeared us to the breed as he was so people-oriented. When we first showed him, a flatcoat in the ring was quite a rarity and he caused quite a lot of comment. Sadly we lost him in his prime to osteosarcoma of the shoulder. He was my first heart dog. Jack arrived off the plane shouting and that was his signature. He was a very vocal dog. He was also very successful in the show ring winning two best in groups, consolation to best in show and was a multiple class in group and show winner. 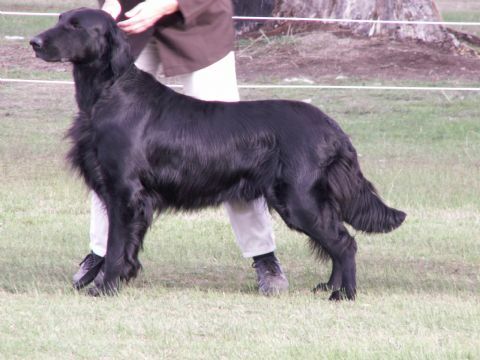 He was the third flatcoat in Australia to gain the title of grand champion. Sweet little Dempsie was our snuggle dog. She loved nothing more than to be with you doing whatever you were doing. She didn't really like the showring but still gained her title. Ali was a very over the top flatcoat with a strong prey drive. She enjoyed being the alpha girl. Grand Champion Bushman The Deputy (2000-2008) Pictured above. My second heart dog, Deputy came to us at 11 months of age and was co-owned with Peter Kennon and Judy Kennon-Wray. He was a very successful show dog being a best in show winner at all breeds level and a consistent class in group winner. He was a delightful dog who just loved being with me. He loved to carry his lead in his mouth when we walked and also loved to prance out of the ring with his ribbons that he had won. Sadly we lost him to suspected snake bite in October 2008. Harry was a very laid back dog who didn't really like showing as he much preferred to be off lead. He loved life and everyone. Sadly we lost Harry to bloat in May 2009. We almost lost Abbi to bloat at the same time as Harry but after a long convalescence she regained her old zing. Sadly we lost her to complications from the original bloat in September 2010. Disco joined us in 2009. He was co owned with the late Peter Kennon and the late Judy Kennon-Wray. Sadly we lost him to cancer in 2013. He is much missed. The dam of our very successful first flatcoat litter. Our lovely India is sadly missed.